How to Reheat Biscuits Straight from the Cupboard? How to Reheat Biscuits straight from the fridge? How to reheat biscuits straight from the freezer? 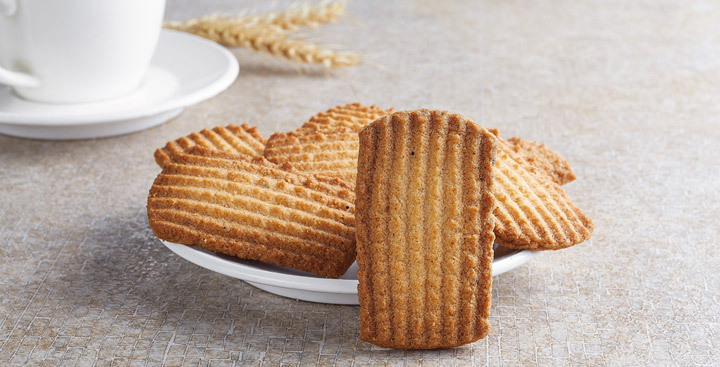 Do you know that storage is vital to maintaining the freshness of the biscuits? Saving your biscuits for later means putting them inside a tightly sealed container and store. Depending on where you store them, it lasts for days and stays fresh. Store them in the cupboard, fridge or even in freezers. You may want to wrap it in little batches with foil before placing in the freezer to make it easier to take out later on. Honestly, I rarely got the chance to store them at home since once the biscuits are done, it won’t last long with the kids around. 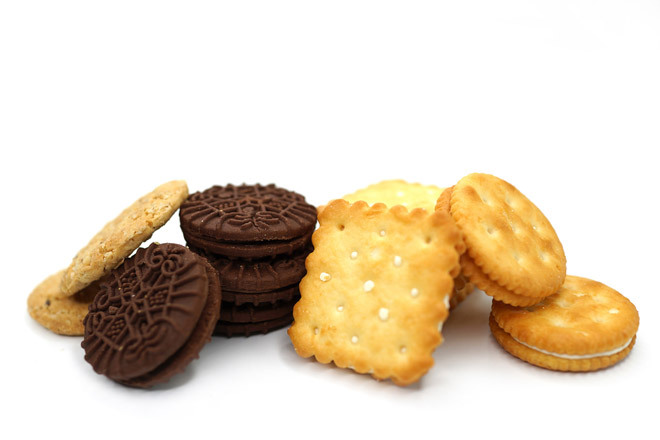 If you want to set aside plenty of biscuits for future need, I suggest placing them separately in small packages. At least, when you can’t resist the craving, getting a package or two is a lot easier than pulling out everything. Do you know that every time you open the container, air comes in? The presence of air inside affects the freshness of your biscuits. Know that there are three ways to heat your biscuits. It could be by microwave, stovetop, and oven. For the busy me, microwave ranks first since it fits my busy lifestyle. The oven is my second choice, and I rarely use the stovetop. Each method has its own advantage. Whatever it is that suits your needs, go for it! Take note that storing biscuits in the cupboards requires the suitable temperature. A cool and dry temperature is required to prevent the biscuits from degrading. Avoid placing your biscuits in the cupboard when it’s hot and humid in the house. Otherwise, it tends to spoil before you have the chance to eat them. Remember: Never store raw biscuits inside a cupboard. You see, in this method, there are two ways to heat biscuits. First is the use of aluminum foil and the other one is the application of glaze. Always keep the heat low so not to dry up your biscuits, making it hard and brittle. Get your aluminum foil and wrap your biscuits. Put it in a pan and make sure to cover. Covering the pan will keep the heat evenly distributed inside. Give a minute for each side of the biscuit to heat. Overheating may make your biscuits toasted. However, some like it toasted too. Take it out from the pan and serve. Glaze your biscuits first with oil or butter (I prefer butter.) This is a little bit tedious compared to the foil technique, but it has its own rewards. Glazing the biscuits while heating gives additional moisture and flavor to it like brand new. If there is the quickest way to heat my biscuits, it’s with the use of a microwave. This method is best for a family that’s always on the go. ​Instead of aluminum foil, (NEVER use a foil in microwaves) use a moist towel to wrap your biscuits before placing it in a microwave-safe container. The moist towel will prevent the biscuits from drying up. The biscuits will absorb the moist from the towel and prevent them from drying up. Just place the lid of the container on top without sealing it. Sealed containers will explode because of the pressure when inside a microwave. Set it to a couple of minutes under medium heat before taking it out from the microwave, unwrap, and serve. They say that the traditional method is the best way to heat your biscuits. Although this takes a longer time than other methods, it sure is worth the waiting. ​First, you need to line your tray with a baking sheet before glazing it with oil or softened butter. Arrange your biscuits on the tray slightly away from each other before placing inside the oven. While doing the first and second steps, preheat the oven to 350 deg. F.
Reheat your biscuits for about a few minutes. Pull it out and serve. 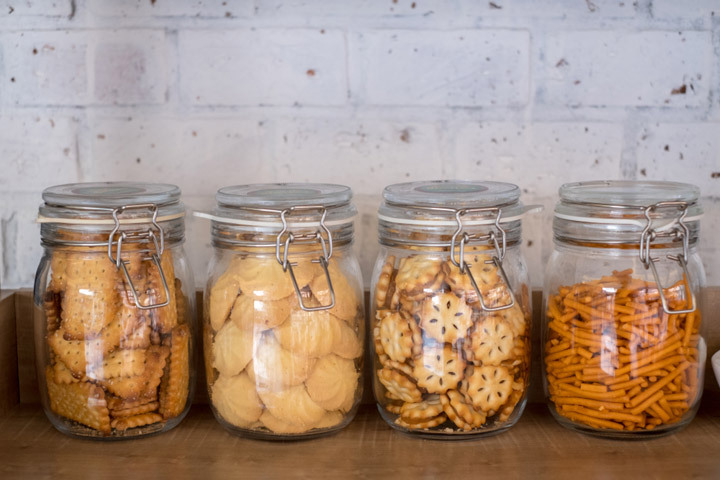 If you have made plenty of biscuits and you know that, it would take you a long time to consume them all, the idea of storing them inside the fridge or freezer is practical. It will preserve the biscuits longer than expected. 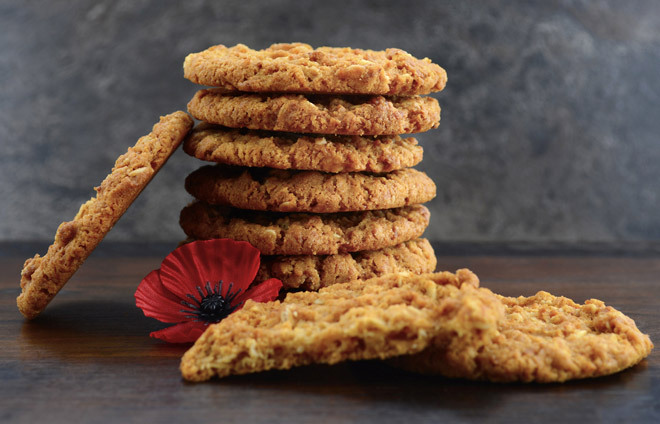 Do you know that this method retains 90% of the biscuit’s flavor? Comparing to cupboards, the fridge is cooler and consistent when it comes to temperature. Keep up the rule of using a tightly sealed container as well as the storing in small packages. Food stored in the fridge openly tend to absorb the odor of all the stored food inside. It does not spoil the smell of your biscuits but also the taste. Remember to use a non-stick pan when heating and always turn the heat on to low. Make sure that you heat both sides evenly. Before you wrap your biscuits with foil, glaze them all up slightly with oil or softened butter. Since the biscuits are cold this time, the oil will create more heat inside, melts the butter and adds up moisture to the biscuits. Place the wrapped biscuits on the pan, and cover for equal distribution of heat. Keep the heat low and reheat the biscuits in a minute, before flipping it over to the next side. You may heat it a little longer, depending on your preference. Let it cool down and serve. 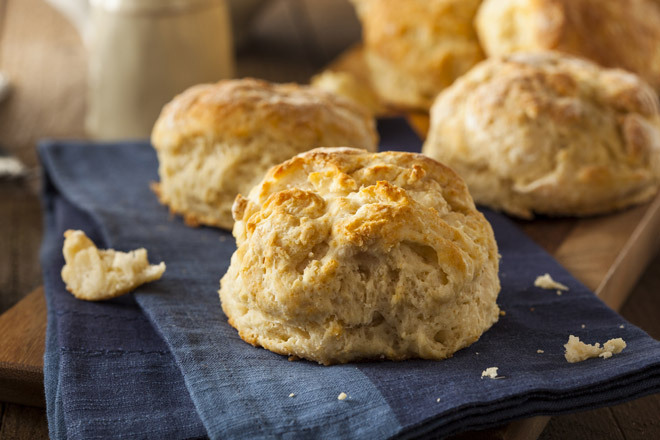 ​Glazing your biscuits with a little bit of oil or softened butter brings out the tasty aroma of fresh biscuits. After glazing, heat it all straight to your non-stick pan. Flip all the biscuits accordingly making sure both sides are evenly heated. Turn the heat off, and serve! Reheating biscuits that were stored in the fridge is at its best when using the microwave. Although you can still use the microwave process of those from cupboards, you might like to try this method for a change. 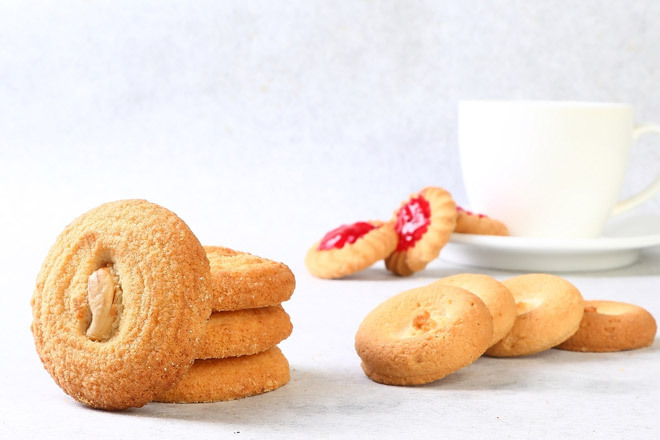 ​After slightly glazing the biscuits with butter or oil, place them inside a microwavable container with the lid just placed on top and not sealed. Reheat the biscuits for three minutes under medium heat. 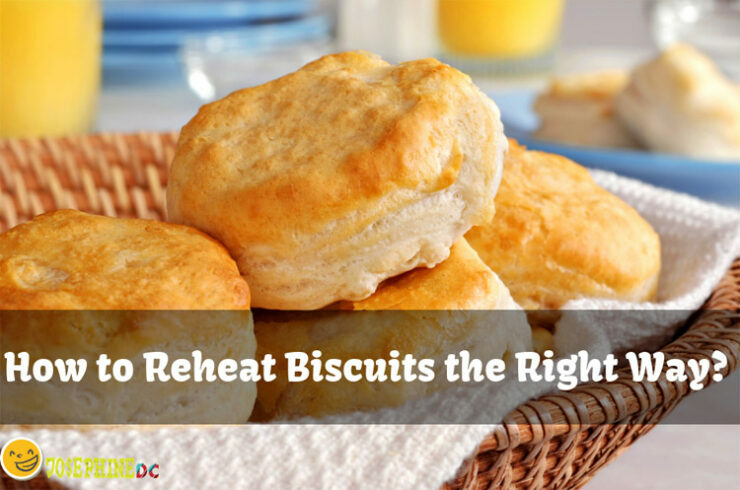 Reheat your biscuits using the same process as those that were stored in the cupboard. However, since the biscuits are cold, you need to heat it longer than the previous. I say that the freezer is the best storage for biscuits. It does not only preserve that freshness of the biscuits, but it stays there longer than the other methods. This is great when you like to manage and save your time. Besides, who does not like to have biscuits all the time? Although you can use the same process as you did with the others, remember that you need to adjust the length of reheating time. You may want to consider the following facts. You need to reheat frozen biscuits a bit longer compared to those that came from the cupboard and fridge. Because of the ice, you may want to check it from time to time to see if it’s already done. It will take time for you to get the hang of it, but soon you’ll know the exact timeframe until it is well done. It is easier to wrap your biscuits with foil while storing in the freezer. This way, you can heat it straight to the pan. One thing I’ve learned is that no matter what method you use in reheating biscuits, it all ends up still delicious and fresh. It won’t take long for you to be able to master the length of time of each reheating method. The truth is, it really varies depending on the appliance you use and how well done you like your biscuits to be. Do you have another practical method on how to reheat biscuits? Just drop a comment and share. I’m dying to know what you’ve got in your sleeves!